You Know What? 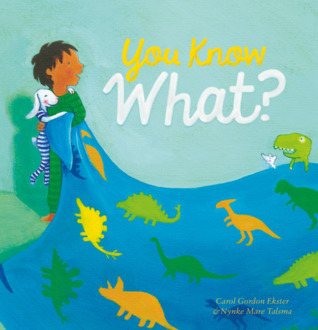 by Carol Gordon Ekster is a delightful bedtime story that will be treasured by kids and moms alike. Oliver knows it’s bedtime, but he’s had a busy day and wants to tell mommy all about it. This is not the first book by Ekster that I’ve read, and I doubt it will be my last. As a former elementary school teacher, she is in tune with what resonates with young people. Oliver continues to toss out the same question to his mommy as he gets ready for bedtime. His tired, yet patient, mommy keeps on listening and encouraging him along the way. It’s a very sweet concept. I also truly enjoyed the artwork of Nynke Mare Talsma. Vibrant blues, greens, yellows, and reds catch your eye as you move page by page through this charming story. I hope we will see more collaborations between these two talented people. bedtime storiesbook reviewsbooks for young readersCarol Gordon Eksterchildren's bookschildren's picture booksparentingThe Children's and Teens Book ConnectionYou Know What? Where Am I Sleeping Tonight? is a great way to help children of divorced parents deal with the change. Mark wakes up to his younger brother Evan asking, “Mark, whose house are we at?” The smell of coffee and a morning radio show tell Mark they are at Dad’s. Things are challenging since their mom and dad got divorced. Sometimes the boys forget important stuff like homework at the other parent’s house. Mom and their step-dad handle things differently at their house than Dad does at his. But it’s great to be loved at two homes. And with a little bit of organization, homework doesn’t need to be so tough. This short children’s book filled with page after page of charming illustrations, helps children of divorce understand that they can make it through all the changes that divorce can bring. From dealing with not always knowing which house you’re waking up in to how different parents handle running a household, Where Am I Sleeping Tonight? will let your child know she is not alone. Your child will be encouraged to initiate change as Mark does when he decides he will focus on the positive aspects of his new life. And since it is Mark who finds a way be more organized so that homework isn’t such a challenge, readers will feel there are parts of their lives that they can control in spite of the fact that they can’t control which house they wake up in. It also helps kids to realize that it’s okay that Mom and Dad handle things in their own way, and that focusing on the positives and controlling the aspects of life that they are able to, will help them feel better about having parents who no longer live together. Where Am I Sleeping Tonight? could also help children of families not touched by divorce understand what their friends might be dealing with. In our everchanging world, it is good to read a book that offers children ways to adjust to change in their lives.